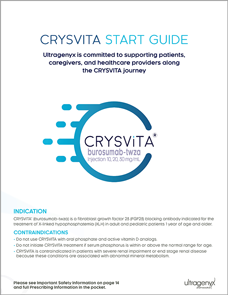 A step-by-step guide explaining your patient’s treatment journey with CRYSVITA. 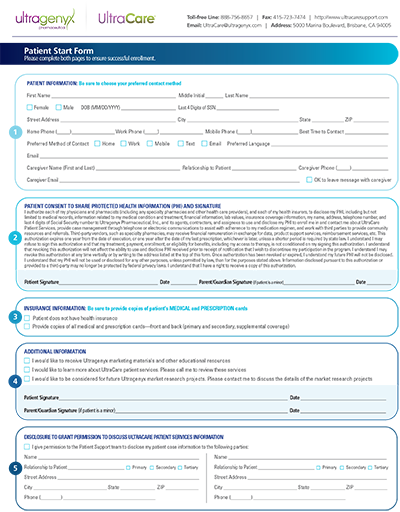 Download and complete the Start Form with your patient. 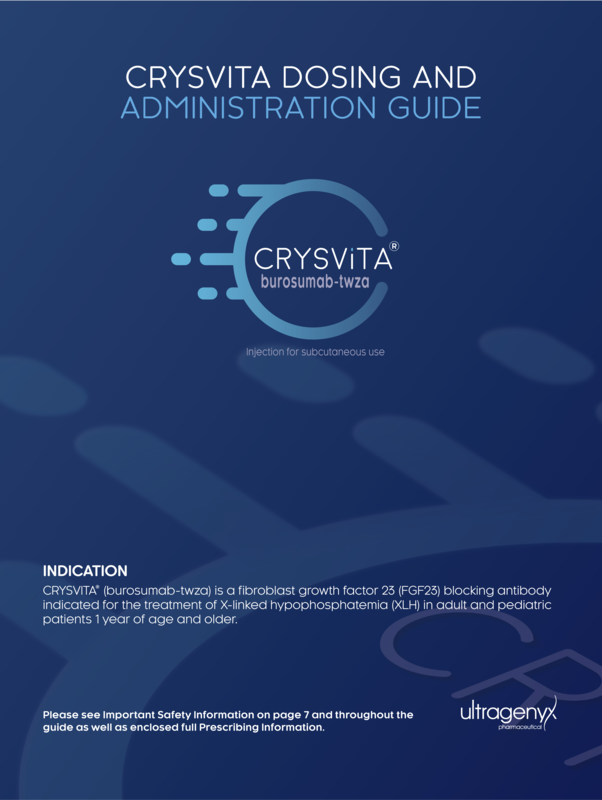 A guide to the dosing and administration of CRYSVITA. The beginning of the study before patients are given any treatment. A method of assessing bone quality from bone biopsy samples. Histomorphometry includes assessments of osteoid volume to bone volume, osteoid thickness, and mineralization lag times. A protein that plays a role in phosphate homeostasis. In XLH, the excess circulating FGF23 leads to increased signaling, resulting in impaired phosphate uptake. A statistic for the estimate of the mean after adjusting for the effect of other variables in a study. The interval between osteoid formation and osteoid mineralization. In XLH, mineralization lag times are long, pointing to abnormalities in the process of bone mineralization. The bone matrix; an unmineralized component of bone. A measurement of the amount of unmineralized bone. A softening and weakening of the bones in adults caused by deficiencies in vitamin D, calcium, or phosphate. In children, osteomalacia can occur simultaneously with rickets. Activities associated with independent movement, such as walking, standing, bending, getting into or out of a car, etc. In Study 3 of adults with XLH, placebo refers to a saline injection. A way to measure the extent of the healing of rickets. This score uses a 7-point scale to rank the healing of rickets and can range from -3 = severe worsening to 0 = no change to +3 = near/complete healing. An RGI-C global score of ≥+2.00 means a substantial healing of rickets was achieved after treatment. This score is complementary to RSS. A softening and weakening of the bones in children caused by deficiencies in vitamin D, calcium, or phosphate. In adulthood, after the growth plates have fused, rickets continues as osteomalacia.